Two Ukrainian troops died in combat yesterday, 14 wounded. One civilian died and six were injured. Fighting near Avdiivka continues around the clock. Militants are intensively using heavy armor near Popasna, Avdiivka, on Butivka coal mine-Pisky position, in Krasnohorivka, in the vicinity of Dokuchaevsk and near the Azov Sea, informed the spokesman of the Ministry of Defense of Ukraine on ATO related issues Colonel Oleksandr Motuzyanyk at a press briefing at Ukraine Crisis Media Center. 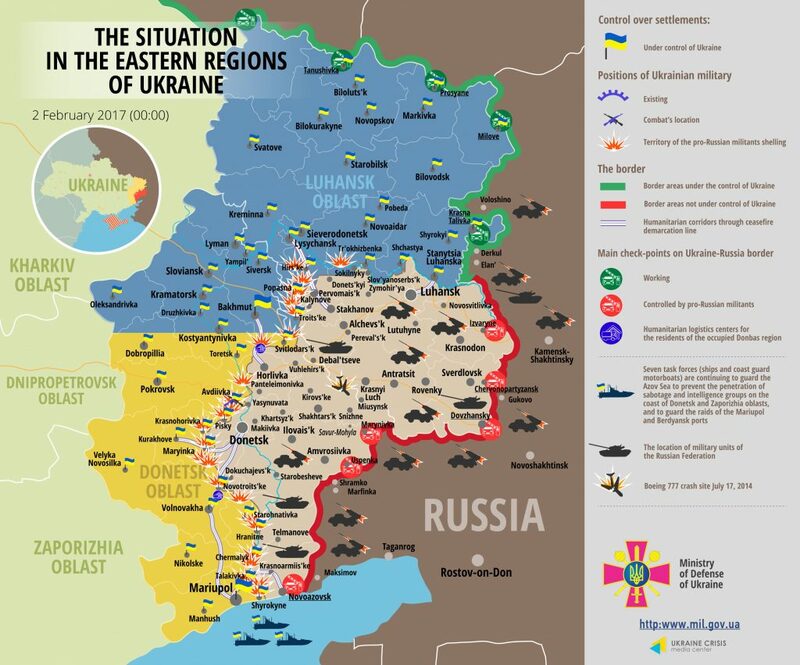 Two Ukrainian troops died in combat yesterday, 14 were wounded and six sustained injuries. “According to preliminary estimates, one civilian died and eight were wounded in Avdiivka since January 29. 40 private houses and six apartments were damaged. In order to prevent humanitarian disaster in the town, Ukrainian troops deployed 10 field kitchens in the town, organized meal stations and supplied Avdiivka inhabitants with five tons of bottled water. Moreover, Ukrainian Armed Forces units set firewood supply process. They are ready to set additional mobile heating units, if circumstances require,” said the spokesman. Russian proxies intensified their attacks at Butovka coal mine flak position. Tank shooting attack from Spartak direction lasted many hours there yesterday. Adversaries opened fire from mortars, cannons and Grad MRLS from the settlement itself. The situation was especially restless at the Svitlodarsk bulge, in Zaitseve, Verkhniotoretske and Pisky yesterday. «Enemies are also using heavy armor in this area, trying to split Ukrainian forces and distract commanders’ attention from the point of main effort. Ukrainian troops are responding with fire, said the spokesman. Militants shelled Krasnohorivka in the Mariupol sector yesterday night. Moreover, in the morning they shelled Mariinka and Bohdanivka from mortars and used armored personnel carrier in Novohryhorivka. Fighting intensified in the afternoon. “A series of hostile provocations was instigated along the entire frontline, involving use of small weapons, cannons and mortar launchers. Late at night, after 10 p.m., occupants shelled Ukrainian positions from large distance. For instance, Russian proxies used mortars near Bohdanivka, 122-mm cannons in Hranitne and Shyrokyne, and cannons and Grad MRLS in Vodiane,” said Col. Motuzyanyk. Almost all militants’ attacks in the Luhansk sector traditionally happened in Popasna district, Vrubivka-Troitske frontline area. Insurgents were simultaneously shelling several Ukrainian positions from armor, cannons and mortar launchers. Two artillery attacks and one provocation involving use of light weapons took place in Krymske. “School premises on the territory of Triokhizbenka village council were damaged and a roof of a building ruined as a result of occupants’ aggressive actions. Militants’ 152-mm projectile damaged two power transmission lines in Vrubivka, Popasna district, and local authorities managed to repair one of them,” said the spokesman. The President of Ukraine Petro Poroshenko signed an order on awarding the troops who distinguished themselves in heavy fighting in the Avdiivka industrial area. 48 soldiers and officers of Ukrainian Armed Forces were awarded with orders and medals. Most of them still remain on the battlefield. Ten heroes were awarded postmortem. Andriy Kyzylo, deputy battalion commander of the 72nd separate mechanized brigade of Ukrainian Armed Forces. He was posthumously awarded the title of a Hero of Ukraine and awarded with Golden Star Order. “On Sunday of January 29, the Day of Kruty Heroes, captain Kyzylo was in charge of a fighting team that defeated occupants’ attack in the Avdiivka industrial area. This fight was successful for the ATO troops, as they destroyed 20 militants and captured one. Our soldiers seized hostile stronghold. Capt. Kyzylo was deterring militants’ attack amidst intense artillery barrage. He died as a hero, but did not withdraw from the position. Our troops are still defending these strongholds,” said Col. Motuzyanyk. The captain had a wife and a little son.